Ecuador is often one of the most overlooked South American countries for travelers and backpackers. After leaving Colombia we thought we would zoom through Ecuador too but during our time in Ecuador we kept finding unexpected towns, like Baños, that we loved. Pssss. If you want to check out 15 mind blowing things to do in Colombia, read our post here. One of the first things that we noticed after arriving in Baños is how cheap everything is. Baños is the perfect little town to visit for budget-friendly outdoors adventures like hiking, zip lining and river rafting. This adventure town also offers some one-of-a-kind activities like swinging on giant mega-swings. With most activities costing under $5 bucks, it’s well worth to spend a few days in Baños enjoying all it has to offer. 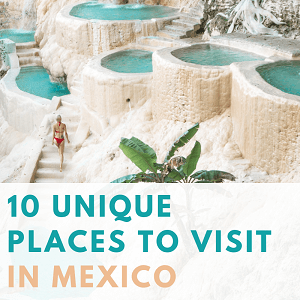 Here’s our travel guide on the 10 best things to do and top things not to miss while visiting this fun adventure town. Pailon Del Diablo is hands down one of the most remarkable waterfalls we have ever visited. 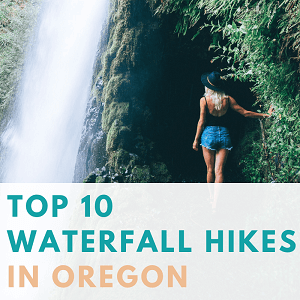 And we come from Oregon that’s like THE place for amazing waterfalls. For only $2 USD entrance fee visitors can hike to a few overlooks of the soaring Pailon Del Diablo waterfall rushing down a black basalt cliff in a lush jungle setting – quite the view! The park has two entrances, operated by different companies and leading to different vantage points. 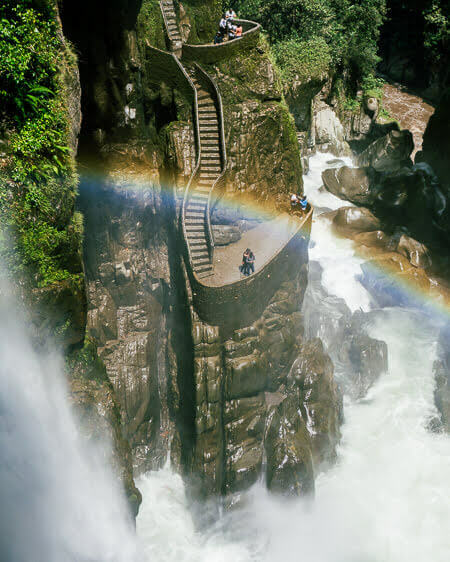 Our favorite was the Isla Del Pailon entrance as it provides a viewpoint of the famous stairs from the other side of the waterfall. As it happens, on the day of our visit, a brand new viewpoint was opened on the Isla Del Pailon side leading to a super close overlook of the waterfall, all topped off by the most perfect rainbow shining through the waterfall mist. To get to and from the viewpoints the park has a cool but a bit sketchy suspension bridge crossing over the river Pastaza below. The entire walk to the viewpoints takes only around 20 minutes but the views along the way are just incredible. 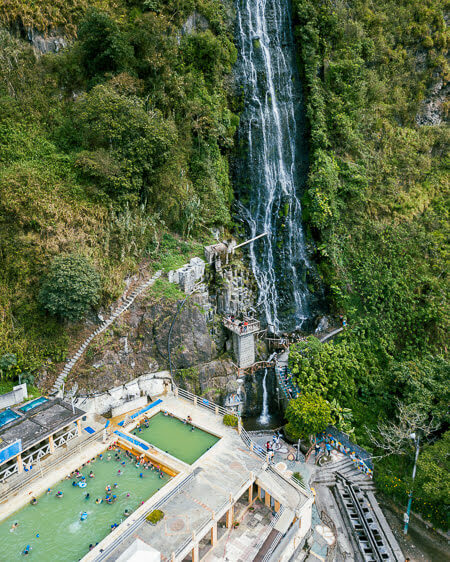 Baños is home to some of the biggest swings in the world and although it might sound as child’s play, there is nothing more entertaining than hearing adults scream and laugh like kids while getting strapped in and swinging into open air with nothing but a couple thousand foot drop off underneath. Even if the swing itself doesn’t sound like a thing you’d want to try, I highly recommend to check them out since the swing areas also offer some of the best viewpoints of the Baños city below. La Casa Del Arbol also called The Swing At The End Of The World, is the original swing in Baños that started the whole swing trend in this city. It still remains as one of the most popular (and cheapest) swings with a $1 entrance fee. Although a few new additions have been made to this swing by adding straps and a runway platform that in my opinion take away from its rustic look, it still remains as the most scenic and picturesque of the swings in this area. On a clear day, you might have a full view of Tungurahua volcano in the background! It’s really a lovely place to visit but come in the afternoon or on the weekend and you’ll be battling the endless tour crowds getting bussed up from Baños. We thought that by showing up at 9 am we were getting there early but we arrived at the same time as the first tour bus and people started lining up for the swing. I highly recommend getting there around 8 am (or before) to enjoy it all to yourself in a more peaceful setting. 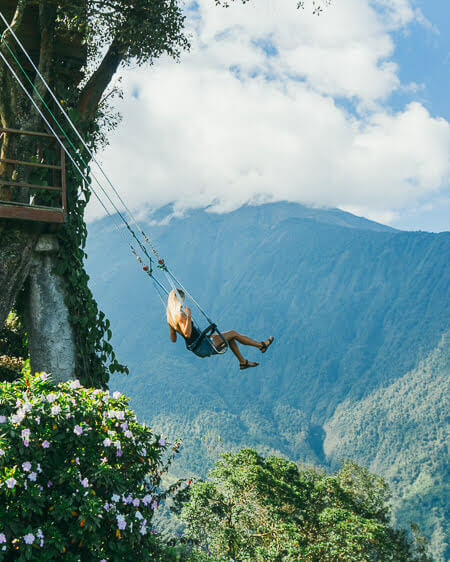 Located right behind La Casa Del Arbo, Torre Al Cielo was the craziest but also most adventurous swing that we visited in Baños. Set up more like a theme park ride that rotates up and down in 360 degrees this type of thrilling swing costs $3 USD but a simple swing is also available for $1 USD. 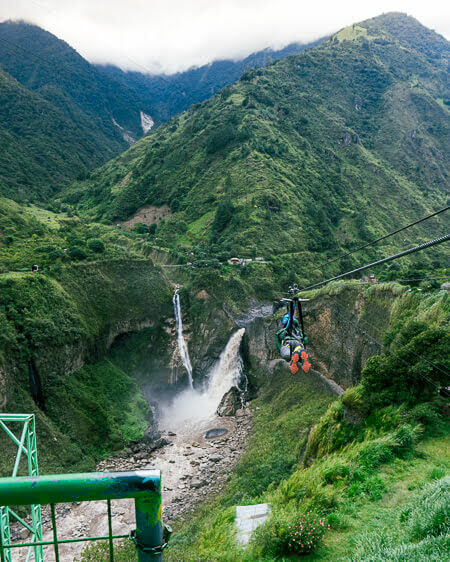 If you’re looking for an adventurous swing that is built for speed and distance, Columpio Fantasia De Volar is one of the best choices around Baños. 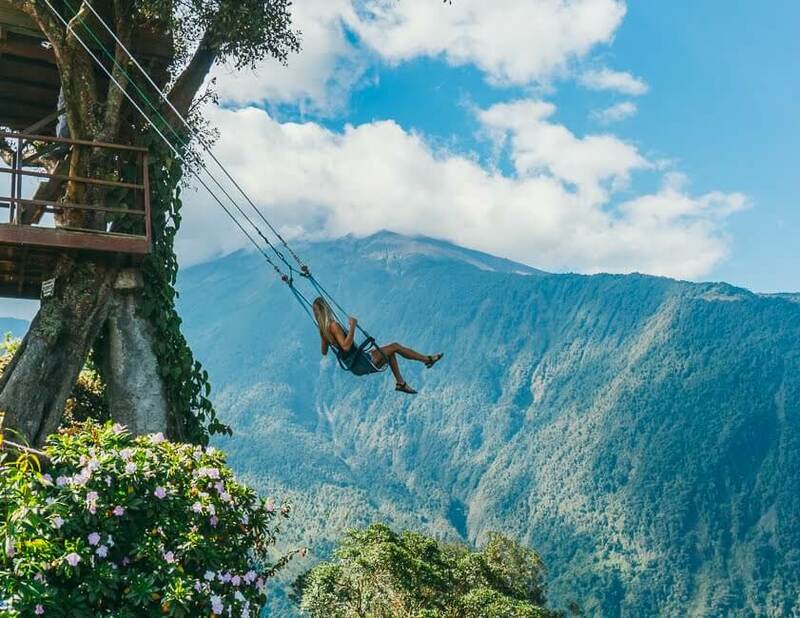 This thrilling swing goes far out over a steep hill overlooking Baños with couple thousand feet of air below. But not to worry, the swings come with helmets and straps to ensure safety while swinging into air. Because Columpio Fantasi De Volar swings are a bit more technical, they cost $10 USD per person and offer a choice of two seats or a single seat. The outskirts of Baños is the best place to head to for adventure parks and cheap thrills. Normally things like zip lining are out of our travel budget, but during our time in Baños we decided to splurge on it. At $15 USD per person it was hardly a splurge and a total bargain compared to other countries where zip lining typically costs around a hundred bucks. 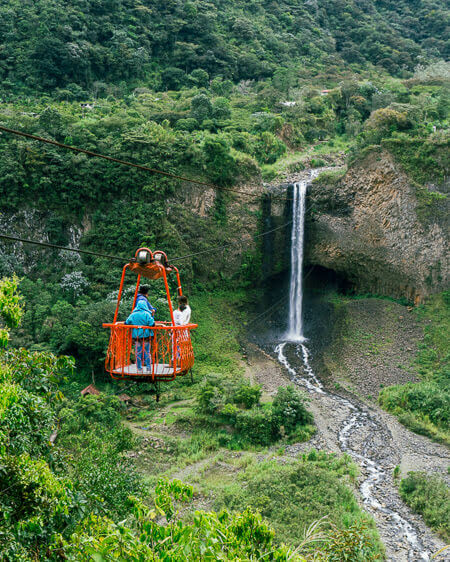 For best zip lining views we headed over to Canopi Banos adventure park that offers zip lines and cable cars over Agoyán waterfall. 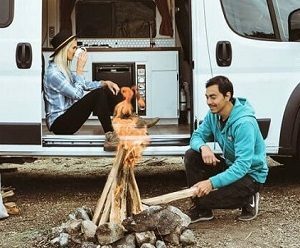 If you love something adventurous mixed with incredible views of two connecting waterfalls, this is the place to go. This adventure park is located around 4 miles out of the town along highway E30. Just look for a big sign that says “Discovery Baños” and the zip lining station will be across the road on the right-hand side. After zip lining over Agoyán waterfall, we kept driving down highway E30 to check out a few of the other waterfalls along this road. We noticed a lot of cable cars operating along this route so we stopped and hopped on a small cable car heading towards Cascada Manto De La Novia waterfall for $2 USD per person. It was a bit of a jerky ride with the cable car coming to sudden stops but the vista of the waterfall from the ride was incredible. The cable car stops just past the waterfall with an option to get out and eat at a local restaurant on the other side. While staying at Baños, visiting one of the hot pools in the downtown area is a must. After all the town Banos is named after the thermal waters found in the area. The mineral springs of Baños are believed to have healing properties. After spending a day out on adventurous activities, nothing sounded better to us than soaking at a hot springs that could heal our sore muscles. Cascada And Termas De La Virgen is one of the most popular hot springs in Baños for thermal water experience. Located next to a waterfall, this hot springs offers multiple relaxing baths AND pretty views. The spa offers daytime and nighttime access. We chose to visit during night time at 6 pm after the daytime pools are cleaned and the water is replaced. The cost for the night time access is $3 USD versus the $2 USD for daytime pass. For those feeling a bit more active, there are a number of bike rentals available in the Baños downtown area. Walk down Ambato Street and you’ll find multiple rental shops along the way renting bikes for $5 USD per day. When the weather is perfect, many people use the bike rentals to navigate around town. For a more scenic route head down highway E30 in the East direction where you’ll pass beautiful panoramic views and waterfalls along the way. There is no shortage of waterfalls in Baños, it’s said to have around 60 in the area! Guided tours offering more challenging routes and downhill biking are also available from Baños. Depending on the type of bike you want to rent, the bike tour can cost anywhere $25 USD for a normal bike up to $50 USD for a full suspension bike. The guided tour will take you on a 2-hour ride up to a few viewpoints before heading downhill on a thrilling ride. 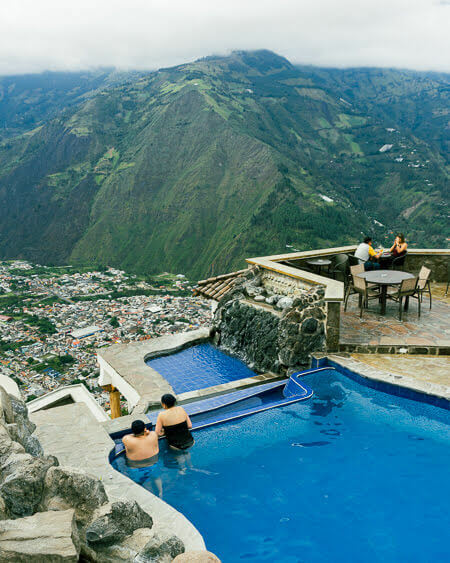 If you’re feeling like treating yourself and indulging in a bit of a luxury, head over to Luna Volcán Adventure Spa to spend the day enjoying brunch at a hilltop restaurant overlooking Baños followed by a relaxing swim in their infinity pool and hot tubs. As one of the nicest hotels available in Baños, an experience like this comes with a bit of a steep price at $20 USD for daytime access to enjoy the property and its pools. For guests staying at the hotel, access to enjoy the pools and spa is complimentary. We have been trying to wrap our heads around how cheap everything is in Baños, including the food. While most of the time we resort to grocery shopping, sometimes we come across places like Baños where it’s more economical to eat out at restaurants than making our own meals. 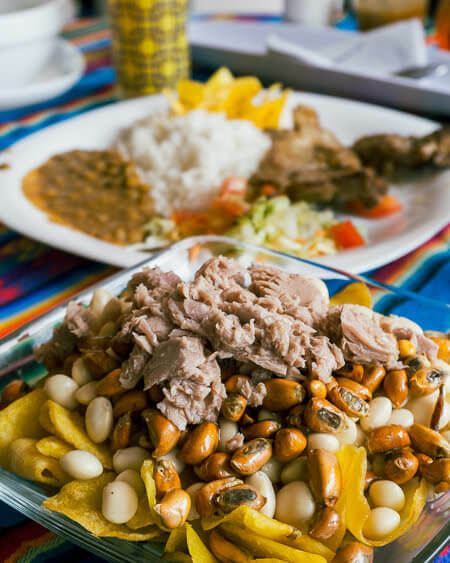 The typical Ecuadorian meal consists of a choice of meat (usually chicken, pork or steak) accompanied by soup, rice, lentils, salad, and a drink. At one of the local restaurants, you can score an entire meal like this for around $3 USD. While most of these local spots are not listed on Google Maps, just head down Ambato Street and look for places advertising “Menu Tipico” – their specialty meal. For something more unique, try “Volquetero” where the main ingredients consist of plantain chips, beans, corn and tuna with a side of sauce. This meal sort of looks like Ecuadorian nachos with a mashup of different ingredients in bright colors and it’s very yummy! In most Latin countries the city plaza is the main place of gathering and trade. If you happen to be in Baños on a weekend, the Baños plaza turns into a little market selling souvenirs and cheap local foods to out of town tourists and visitors. The center attraction of the Baños plaza is the majestic Nuestra Senora Del Rosario De Agua Santa Church – with quite the lengthy name! With a backdrop of a green mountain range, it towers over Baños and can be spotted from just about anywhere in town. To people of Ecuador, the town of Baños is believed to be a place of holy water and healing powers. The inside of this church has huge murals depicting miraculous events from Baños history and past. It’s a beautiful place to stop for a bit and learn more about Baños origins and story. 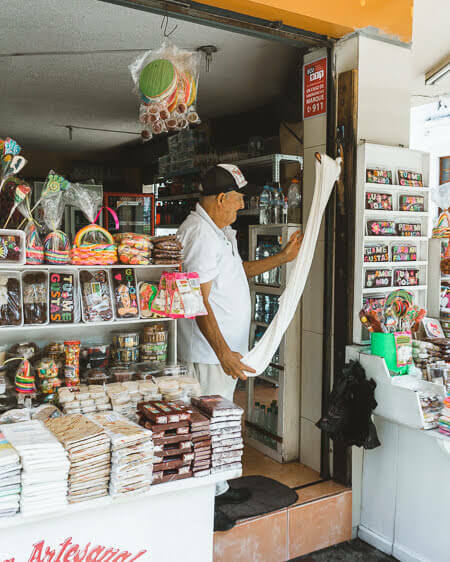 As we were walking around Baños downtown area we couldn’t help but notice all the candy shops located on street corners and along the main strip. Many Latin countries are keen on their sweets, but these candy shops had a person or two making candy in an open doorway. As it turns out, Baños is known for their homemade Taffy made of cane sugar that’s often enhanced with some colors and flavors like tangerine – my personal favorite. It makes for a cute souvenir to bring home, or if you are anything like me, eat it all on the spot! 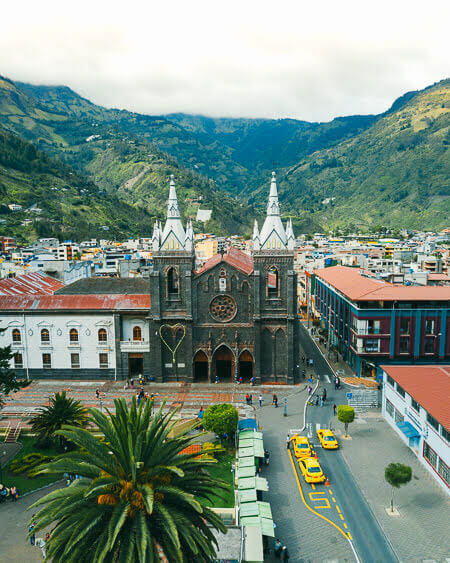 If you are planning a trip to Ecuador, Baños is a town you should have on top of your list! It’s cheap, it’s fun and it’s just plain beautiful. We loved this little adventure town and we hope you do too. If you have any questions about Baños, don’t hesitate to ask us in the comments below! Selina Banos – a modern upscale hostel with a rooftop bar and restaurant in the center of the town. Hands down the nicest looking hostel in Banos with beautifully decorated lobby, rooms and hang out spaces. La Floresta – a relaxing hotel & hostel in a quiet neighborhood of Banos with charming rooms and a beautiful garden. Make sure to book it early – it’s known to sell out quickly! Balcon Del Cielo – one of the best sellers of Banos with incredible views overlooking volcanoes and rivers running through the valley below.